Today’s blog post comes to you in two parts for a double whammy of pinup Hermione goodness. 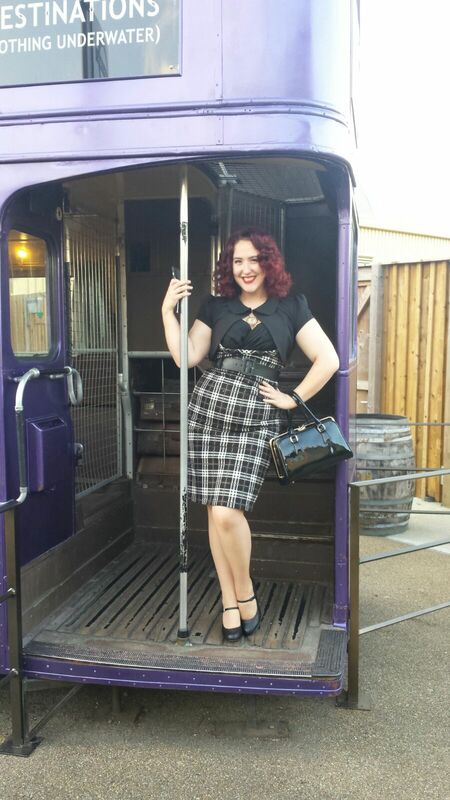 This post focuses on the trip I took to the WB Harry Potter Studio Tour in London with 3 of my nerdiest and loveliest pinup friends. After meeting Kayla and Laura at The Pinup Picnic In The Park in June I fell in friend-love with them. Two wonderful, witty and sweet ladies, Sophie (my British Belles wifey) and I were both thrilled to discover the girls are big Potter fans just like we are. ‘Why don’t we do a Potter meet up then? We could go to the tour,’ it was suggested after we had all recovered from the Picnic. ‘OMG! Potter Pinups tour!’ was the response. It was almost immediately suggested that we go as pinup wizards. There was talk of representing all Hogwarts houses, or specific characters. In the end I opted for being Pinup Hermione, something I had been wanting to do for a year or so, and Soph, Kayla and Laura all chose to be vintagey Hogwarts students.